He bore our sins. He didn't just carry them; he suffered the penalty we deserved. His anguish was our healing. 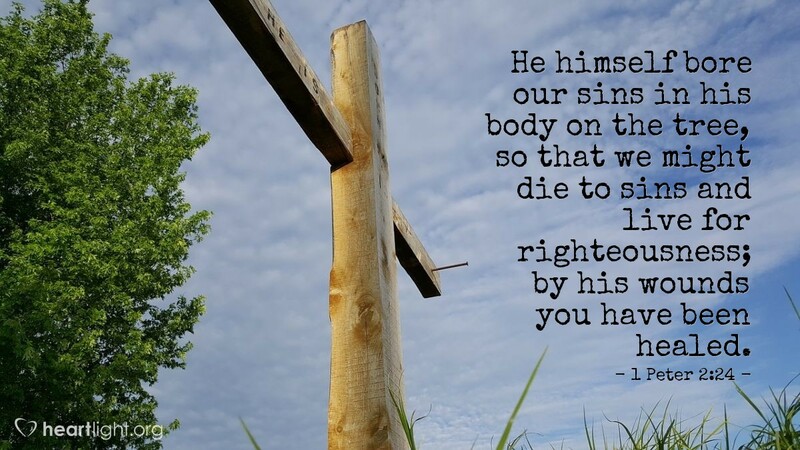 His suffering was our righteousness. How can we ever think of going back to sin after he suffered so much to bear its penalty? Holy God, how you could stand to see your precious Son under the weight of my sin, all sin, I will never understand. Thank you for such great a love and for being so great a God. There is none who can be compared to you, O God. Your greatness is beyond imagining and your love beyond my dreams. I will live today to your glory through Jesus who bore my sin so I could be your child. In the precious name of your Son I pray. Amen.